My wife was in the house. 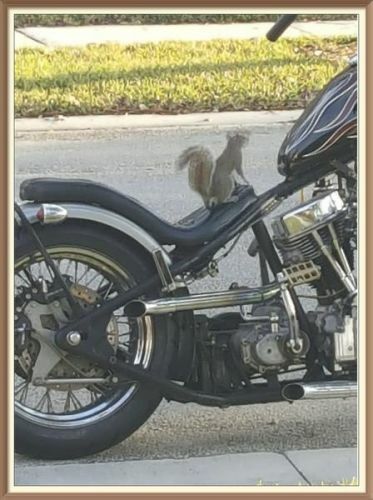 The Panhead was in the street. Stu, the squirrel, barking in the tree. Liked his seeds on grass, not concrete. don't know why he decided to stay. when the ducks up and flew away. His favorite food was the seeds. He ate them till he couldn't run. I trained him to eat out of my hand. Was hopeful, a new friendship had begun. He loved to climb on the chopper. Fall asleep and rest on the tire. He would play among the spokes. Had no idea a plan was being conspired. Should have noticed the plotting. Should have watched him casing the place. Thought he knew not to cross the line. when the bike was in the street. I didn't put two and two together. He was conniving while being discreet. I began to think something was up. A nagging feeling in the back of my head. I thought he was just a friend. Should have known I was being misled. Next day, I decided to go on a run. Kick-started the bike, time to ride y'all. Went in the house to grab something. Came out, an empty space was all I saw. since no witnesses were around. what the security camera had found. My squirrel buddy Stu, went for it. Took a giant leap onto the seat. The bike went into gear and off he went. His plan worked, he even took the seeds.